Book residential property in Sector Zeta, Greater Noida. Paramount Group has launched residential township which is named as Paramount Golf Foreste Villas. It is a luxurious project, spread across 104 acres of area. The Paramount Golf Foreste offers 3 bhk and 4 bhk ready to move in luxury independent villas and AC apartments for homebuyers. These villas and apartments are spacious and designed to keep in mind customers’ requirements. The floor plans are different in sizes staring from 1742 sq.ft to 3008 sq.ft. The project is designed by famous architect Surbana International. 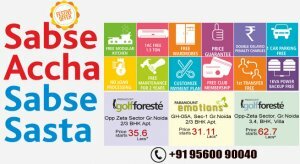 For More Details about Paramount Golf Foreste Villas, Floor Plans, Site Layout, Location, Price list etc.